You must have heard of the expression being ‘in The Zone’ and most of you have experienced that feeling of oneness, cohesion, and ease of accomplishment. Can you cause this feeling to occur more often in your life? 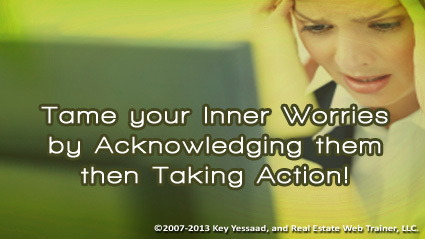 The biggest culprit that keeps you from experiencing the ‘in the zone’ type of accomplishment is you, more precisely your inner worries; we all have a voice, an inner monologue, that chirps about all the things that weren’t finished; that reminds you of upcoming meetings you failed to place in your calendar; that stirs up the fear that there may not be enough money to pay the rent; and on and on – it can’t help it, but you can do something about it. Your ‘Inner Worry’ Mind needs some time to play, let it; commit every worry that pops in your mind to your notepad or evernote (if you have a tablet); basically write down your worries as they pop, example: I am worried my closing tomorrow will not happen because I have not heard from the Lender. Two things will happen when you commit your worries to paper; a nugget of action will occur to you, and you must listen to yourself and write down that action in your To-Do list or Calendar, and act on it at the appropriate time; the second things that will occur is a temporary silence from your ‘Inner Worry’ Mind about that specific concern, and it will move on to the next one – which is exactly what you want. Repeat the process and you will be amazed to notice that most of your worries come with action, therefore you can do something about them – and the moment you take action on all your worries a powerful and serene side of you will emerge – and I promise you you will like that person!